How is it the Fourth of July already?!! I usually don’s say, time flies, but whoa has it ever this past few months. Per usual, I like to pay attention, live in the moment, and enjoy each day as it comes. I suppose it’s been easier said than done as of late. This past weekend we were in California for Grateful Dead concerts, a month ago we moved into a new house, and a few weeks before that we were in NYC. It feels so much longer than that, but it was just two months ago. No wonder it’s been a whirlwind! We haven’t even gone camping? I was just looking at the calendar to figure out a good time to go camping and I have yet to find one, that makes me sad. Must figure it out. Since it is the Fourth of July this weekend, and my family will be here visiting from Southern California we are making this a party! A family party is never good without good dips right? Why not up our dip game here in two ways. Serving Sabra Greek Yogurt made with the best Greek yogurt I’ve ever tasted, and fresh chopped vegetables swapped out from those “other” not so healthy dips is one way, and a good place to start. Next, roast those vegetables for dipping! Roasting vegetables is the best way to add flavor, and sweetness to those dippers. 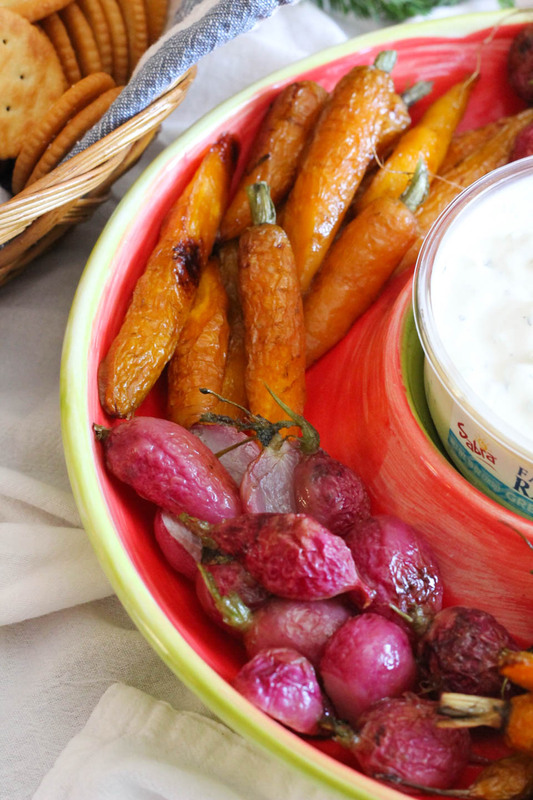 Roasted Radishes and Carrots with Greek Yogurt Dip is a serious happy appetizer in this house. We ate it for the Super Bowl, all week because I make enough for leftovers, an now for this Fourth! My niece will be the one who finishes this off for sure, it’s one of her favorites. 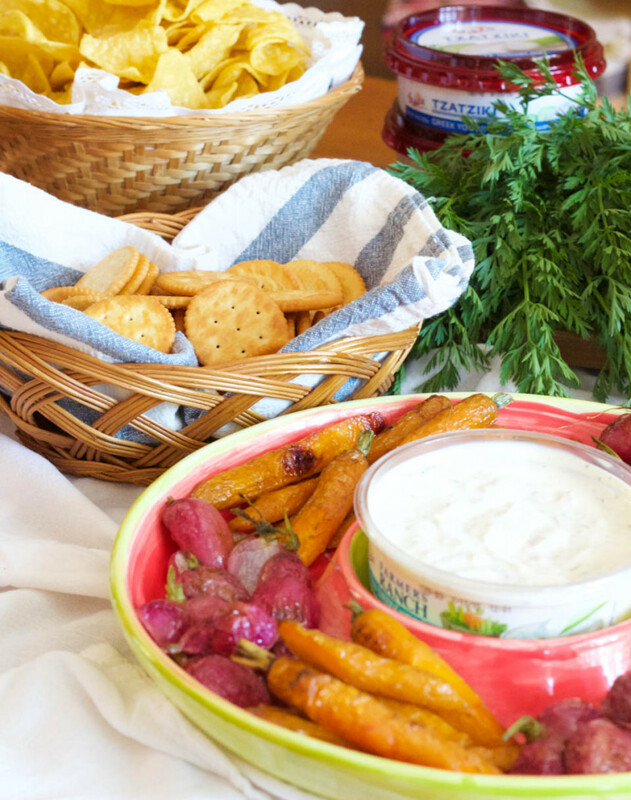 Serve these Roasted Radishes and Carrots with Greek Yogurt Dip, chips, crackers, and some not roasted vegetables to have a variety of goodies for your party! And by the way, go find the Ranch flavor ASAP. You’ll thank me later. It’s Sabras newest flavor, and off the hook delicious! Fresh farmers market vegetables made to taste like Ranch with Greek Yogurt? Ya, go buy it :). 1. Place radishes, and carrots on sheet pan with olive oil, salt, and pepper, toss to combine. Place in oven, and roast for 30 minutes. 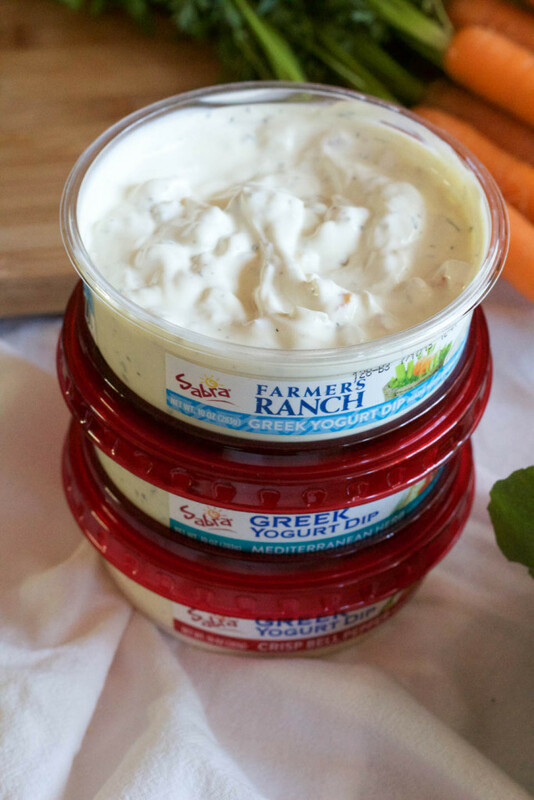 Serve immediately with Sabra Greek Yogurt Dip! Other recipes with Sabra Greek Yogurt from NJB and my blogging friends! Those roasted veggies look fantastic! Roasting vegetables is my favorite way to jazz up vegetables and make them even yummier. Great idea for the dip! Never had roasted radishes before! I love them raw, I’ll bet they’re great roasted! What a great idea to roast the vegetables to serve with dip! Roasted radishes? I didn’t know that could be done! Brilliant! It can! 🙂 Thank you! 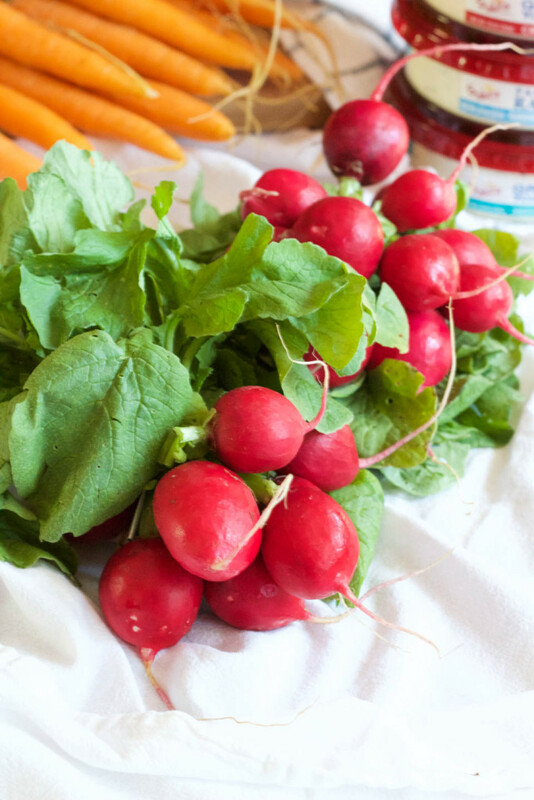 I LOVE roasted vegetables but it has never occurred to me to roast radishes – can’t wait to try it!! I love the tangy yogurt with sweet roasted vegetables too! It makes all the difference. I LOVE roasted vegetables! I’m making a ton of roasted vegetable for this week and I’m so excited to dip them in that delicious ranch GYD….yum! They are the best! Especially in big batches dipped in all things! I’ve never thought to roast radishes. I assume it would reduce the the bitterness and add sweetness? I don’t know why it’s tradition to serve dips with raw veggies b/c roasted ones are SO much better! Love roasted radishes and they’d be soooo good with some greek yogurt dip! That is exactly it! Roasted is always better! Roasted radishes sound soooo good! What a combination with carrots and Greek yogurt. I loooove roasted vegetables, but have never though to serve them with a dip! 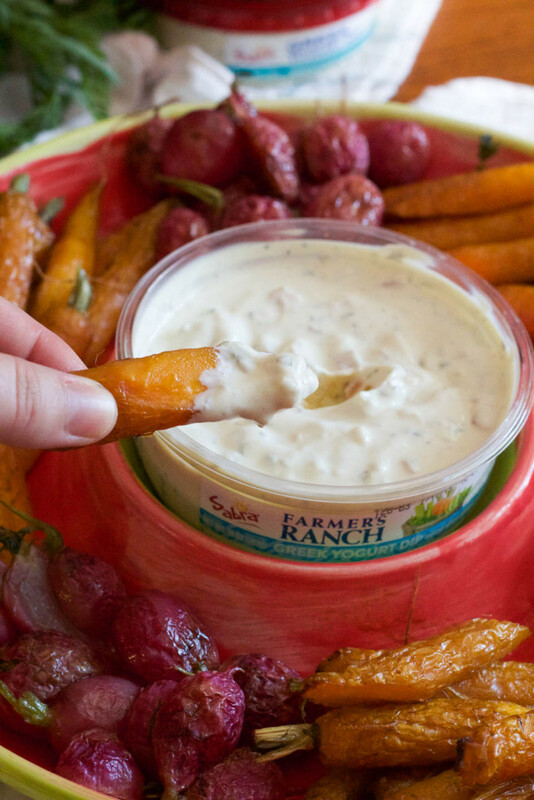 I enjoy the Sabra Mediterranean Herb Dip so much (love that tang from the Greek yogurt). Now I’ll have to keep my eye open for this Farmer’s Ranch. It looks awesome! It makes a huge difference with dips, ups our dipping game! Thank you! I love the look of these. Hopefully, I score some carrots and radishes in my CSA today. Thank you! That would be perfect wouldn’t it?! !